I have been trying to write an explanation of the notes that follow Rule 13.2.f (which is about the permit to remain within 5m of the ball when within the circle and shadow an opponent, in possession of the ball, who has taken a self-pass). I think what is written following 13.2. f contains two logical fallacies which are not explained away by the words “On this basis” and “are therefore“. 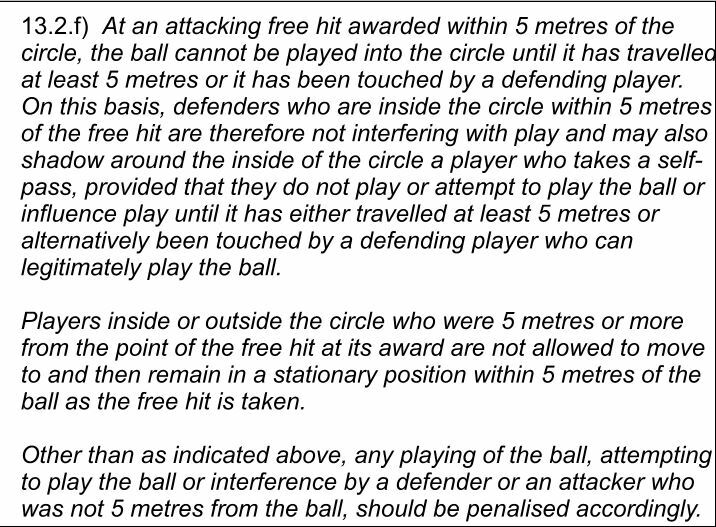 I can see that “are therefore not interfering with play ….provided that they do not play or attempt to play the ball or influence play” (my bold) is true, but it is a circular argument. It uses the premises as the conclusion and would work just as well (badly) in either direction. It does not explain why 13.2. c is being overridden when there is an offence committed between the shooting circle and the hash circle. 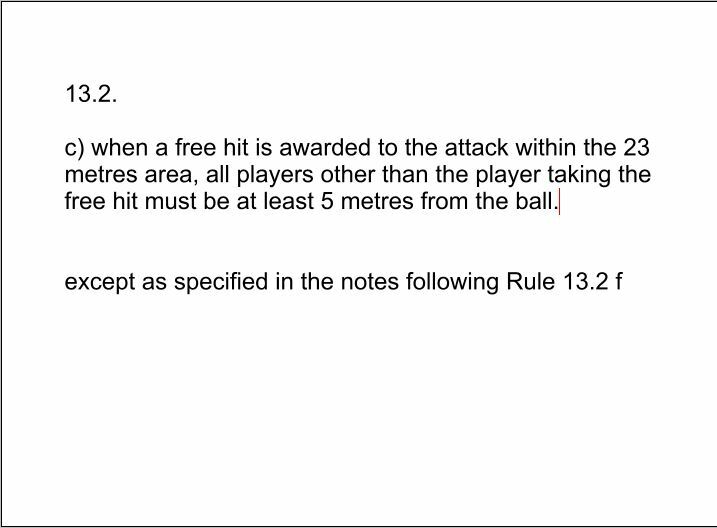 Can anyone put the ‘explanation’ that follows Rule 13.2.f into simple Plain English and (more importantly) provide any reasonable justification for including it in the Rules of Hockey? What was wrong with taking the ball outside the hash circle when a free ball was awarded between the shooting circle and the hash circle? That seemed very sensible to me (especially compared with the alternative we have been provided with). Defenders could then defend to the edge of the circle without getting within 5m of the ball and the umpire’s task was easier. Is the explanation given in the video below real? “It didn’t look good on television“. Does shadowing – but forbidding a tackle – look any better or even understandable on television? No, it looks very strange, especially when a defender is penalised for even attempting a tackle. I agree that placing the free outside the circle created a great deal of forcing of penalty corner awards but that was because it was not (still is not) possible to play the ball with a pass directly into the circle, so self-passers tried to dribble the ball over the circle line while also “trying to find a foot” or force some other kind of infraction from defenders. It had nothing whatsoever to do with the fact that the free had to be taken 5m from the circle. The newly introduced facility to take a free ball from just outside the circle is not going to improve the previous situation. Why should it? A pass still cannot be made directly into the circle: if anything it makes the attacker’s task more difficult: there is in that situation, no or very little forward space into which to move with the ball. Obviously the way forward is to withdraw this ban, which is irrational anyway when compared to with playing the ball into the circle in open play or the setting up of deflections during a penalty corner (it is the possibility of dangerous deflection, a potential danger, which is said to be in-back of the prohibition). It would make far more sense to ban the raising of the ball into the circle with a hit of the ball away from the continued control of the hitter, in any phase of play, that is prohibit a raised hit pass rather than 3D dribbling with the ball, including dink hits which do not propel the ball beyond the immediate control of the dribbler. Maybe that isn’t as obvious to others as it is to me. This might explain why the FIH RC persist with the present knot of interpretations; including forget lifted-think danger (which also forgets that an action which is contrary to Rule – an intentionally raised hit, not a shot at the goal – which disadvantages opponents, has unfairly disadvantaged opponents and should be penalised) It is a long standing principle of fair play that no player should gain an unfair advantage from a breach of Rule. In soccer it takes at least two minutes to set up a free kick within 25m of the goal (with the referee having to mark the ground with a spray), that also looks terrible on television (besides treating professional players like unruly kids)- but what wonderful tension – just as with a hockey penalty corner, FIFA are not going to change this, they don’t care what it looks like on television.